Woodcliff Lake, NJ – January 28 – MINI USA and LAP MotorSports LLC are gearing up the MINI John Cooper Works Team for the 2016 season of the IMSA Continental Tire SportsCar Challenge (CTSCC), the first full season for the team. The team also today announced the addition of a third car and two new drivers – Ethan Lowe and James Vance. Building on the momentum of the team’s first podium at the season finale at Road Atlanta last year and a solid performance during three days of testing at The Roar Before the 24 , the team is hopeful for more podium finishes during the 2016 season. The season kicks-off this Friday, January 29th, at Daytona International Speedway . The Indianapolis-based MINI John Cooper Works team owned and operated by racing veteran Luis Perocarpi will return this year with drivers Mat Pombo and Derek Jones. 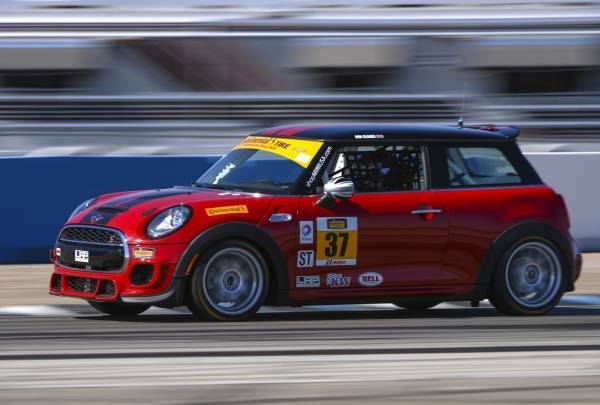 The racing duo, who brought MINI JCW its first podium finish at Road Atlanta last year, will return in MINI JCW #73. This year they’ll be back in the car for the entire season of CTSCC battles. Also joining the team with Mat and Derek is Ramin Abdolvahabi, who drove MINI #52 during the last half of 2015. Newby James Vance will be joining the MINI JCW Team this year. A very quick, young driver from the U.K. by way of Canada, he drove Karts for seven years and competed in SCCA Mazda MX-5 Cup in 2013 with best finishes of second at Road Atlanta and fourth at Canadian Tire Motorsports Park. Ethan Low comes off a stellar rookie season in 2015 that saw him finish sixth overall in the Street Tuner class, including two forth place finishes and five top tens. Low was the top finishing rookie closing driver in last year’s field. Low returns to Daytona where he made his first career start in the series qualifying sixth in last year’s BMW Performance 200. The team will compete with a fleet of production-derived MINI John Cooper Works Hardtop race cars closely related to the John Cooper Works Hardtops that are currently on sale at MINI dealerships across the U.S.
For a full schedule of the 2016 Continental Tire SportsCar Challenge series, please visit IMSA.com . To follow the team during the race on Friday, January 29th go to IMSA.com or download the IMSA app. Follow #37, #52 and #73 while they compete in the Continental Tire SportsCar Challenge! Green Flag is scheduled for 1:45PM. . . .